Oops, I said PAGEANT! I wonder what the contestants be wearing? Oh, no! I said contestants! Okay, there I go again! Let me correct myself. I wonder what the candidates in Miss America 2.0 will be wearing under their sashes that just say the names of their states. Will the Miss America sash simply say, AMERICA? Oh, gracious! What if one of the CANDIDATES takes a knee to protest? With swimsuit gone, what about evening wear? Gretchen Carlson once said, “Whatever makes them feel confident.” Will a candidate wear a nightgown? I mean, a nightgown is considered evening wear, right? How much airtime will Miss America, Cara Mund be granted? She won’t win, Miss Congeniality with the Miss America Board since she has been very outspoken about her year and her treatment by the newly structured organization. But isn’t this what the NEW Miss America 2.0 is all about? A strong woman who speaks her mind and stands up for herself? Hummm. The bottom line is that one woman will be announced on Sunday night as the winner. But, in my opinion, the real “winner” will be Gretchen Carlson’s agenda. 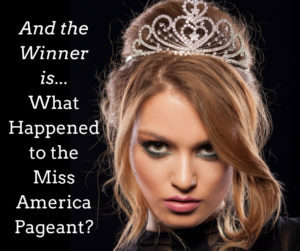 Sadly, Miss America 2.0 may not be walking a runway, but the plank.